I know that Rush is not your typical metal band but I consider their album '2112', more than my acquaintance with Deep Purple, Led Zeppelin and even Black Sabbath, my honeymoon with heavy metal. I could not imagine anything heavier in those days than its title song and the screams of the priests of the Temple of Syrinx. In Rush you can hear, except a band, also an orchestra. In their records A Farewell to Kings, Hemispheres, Permanent Waves and Moving Pictures I heard music that was complex and accessible at the same time. Rush was the band in which the singer had a funny voice and the instrumentation was tight as a clock. Instruments that sounded greater than the sum of their parts. More than on the synthesizer infused records later in their career I heard a world come alive that expanded itself far beyond the out-of-space lyrics from Cygnus X-1 (on A Farewell to Kings). Like the libretto in a Wagner opera, I enjoy those lyrics usually more for the way they sound than for what they literary mean (although '2112' gave me my share of Ayn Rand - long story short: 1. Rush got me in Ayn Rand 2. Life liberated me from Ayn Rand 3. Schopenhauer liberated me from life 4. My girlfriend liberated me from Schopenhauer 5. Conclusion so far: everything in life is temporarily, nice to have some perspective). ​Both Neil Peart and Richard Wagner take their responsibility for their lyrics very seriously. They have to enlighten, inform and educate the audience. But for both composer and band counts that it is the ridiculously high standard they have set with their music that saved their name for posterity. I can narrow the piece of music down that convert me to the music of Richard Wagner. Both metal and opera has soundtrack kind of qualities. Music that longs for a world that lies behind the horizon of the world we know. A world that ought to be. With that in mind the road from Xanadu to the fields of Brabant in Lohengrin is shorter than you think. It was the ouverture of Lohengrin that drew my attention and eventually got me hooked. Like a painting that keeps revealing new secrets every time you look at it again, I could not get enough of this remarkable seductive piece of string hypnosis. 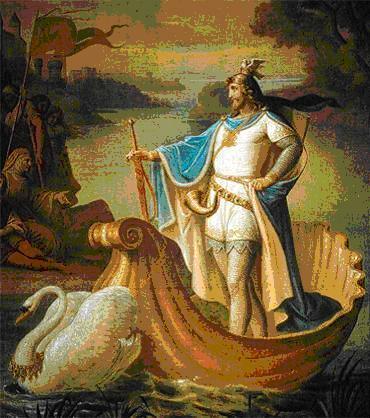 The story of the swan knight Lohengrin is like a fairy tale but it is Wagner's music that turns the super natural into a profound human experience of flesh and blood. It is the music that sends its message. Perhaps the synopsis looks silly, it is the music that tells the real story. A story that resonates with the purest of human feelings. There is a lot to be said for the healing that can come from music that is a worthy partner of the feelings of anxiety and insecurity one can encounter in life. Whether it is delivered by an orchestra or a (metal) band. Whether liberation and consolation comes from an aria about impossible love or from the sonic assaults of metal band Death. One can only be grateful that there is a world of sound that mirrors our longings and shortcomings. Music that reliefs the heart and tells us, by listening, that we are not alone.